HMV’s plans to get UK business back on track? Increase its in-store vinyl stock. Back in December, we questioned whether UK entertainment retail chain HMV would survive the e-commerce revolution, what with its £36m in losses ‘n all. Its future viability was later brought into question again, following a pretty disappointing Christmas sales slump. HMV is still one of the country’s biggest entertainment retail chains, but it has had to close around 30 stores in recent months, as the online entertainment revolution gains momentum. It’s also looking to offload its live venues such as London’s Hammersmith Apollo and Kentish Town Forum. The problem, you see, is that HMV has been slow to embrace the Internet revolution. Its steady growth from when its first shop opened in 1921, through to its late 20th century co-dominance with Virgin in the High Street entertainment retail store market led it to become complacent. It seems it was either too big to properly pivot, or it simply underestimated e-commerce. Of course, HMV did recently announce plans to move into the online movies-on-demand space, but it may be too little, too late, with Netflix now locking horns with LoveFilm in the UK. 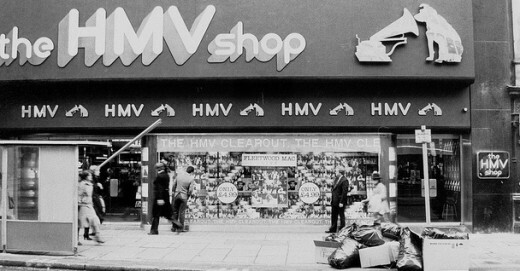 However, HMV’s latest plans to swing things back on track will surprise some. As NME reports, the retail chain is going back to its pre-digital roots, and plans to increase its vinyl record stock in response to customer demand. A spokesman said that the company will never turn its back on physical-format music, with vinyl seemingly singled out for special attention. Could it be that vinyl will save HMV’s bacon, and reverse the trend that has seen the likes of iTunes, Spotify and Last.fm rule the music roost? Ha ha, of course not, but HMV’s reaction to the digital market decimating its traditional business is an interesting move nonetheless. On the back of its recently announced losses, HMV previously indicated that it would be focusing more on hardware in future, with tablets and other gadgets taking centre stage in-store, whilst computer games would also be given a prominent billing. Whilst singles are pretty much dead as a dodo in terms of physical format, around three quarters of albums are sold on CD, with HMV noting that a not-insignificant chunk are bought “in-store.” But that’s pretty short-sighted – I wouldn’t be surprised if that figure fell below the 50% mark within a couple of years. However, there’s little argument that vinyl has cast a pretty strong spell on music lovers the world over. Records have outlived audio cassettes and mini-discs, and they’re hanging around to see if they can stick the boot in on CDs too.